Washington -- President Bush wants to change the Department of Defense back into a War Department. No longer are the Army, Navy, Air Force and Marines to defend America and American vital interests. In his speech at West Point last weekend, the president showcased a war agenda that included fighting for 'human liberty' against "terrorists and tyrants" and for "free and open societies on every continent." Who is this guy, Napoleon? Let's get this straight. The military forces of this country are no longer commissioned to fight for America's defense. Rather, they must stand ready to head for any continent that's home to "tyrants," every country where "human liberty" is being denied, any nation that is not "free and open." If we don't like a leader, if we don't like the way a country's being run, we're ready to send in our forces. Look out, Saddam Hussein. Look out, Iraq, Iran, North Korea, Cuba, Libya, Syria -- and any other country Bush decides to add to the "Axis of Evil." Either you carry out a "regime change" or we're coming to get you! "Our nation's cause has always been larger than our nation's defense. We fight, as we always fight, for a just peace -- a peace that favors human liberty. We will defend the peace against threats from terrorists and tyrants. We will preserve the peace by building good relations among the great powers. And we will extend the peace by encouraging free and open societies on every continent." As history, this just isn't accurate. The purpose of this country's military has always been to protect this country and its vital interests. All the big wars -- the Revolutionary War, the War of 1812, the Civil War, World War I, World War II, Korea and Vietnam -- were fought for strategic reasons. What are these new goals Bush has put forth? What ideology justifies this aggressive new role in the world, making us a global American Civil Liberties Union at war with every country that fails to give its citizens the rights enjoyed by Americans? 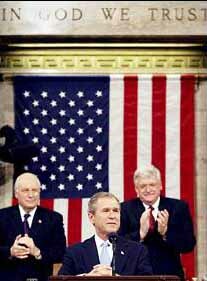 All this talk is merely the pretext for an unprovoked U.S. attack on Iraq. The ideological hawks around the president can't prove any Iraqi involvement in Sept. 11. Nor can they prove Saddam Hussein supplied the anthrax for those letters last fall. So they're setting up another cause for war. "I think this is a predicate for an attack on Iraq and I'm very concerned about it," Sen. Dianne Feinstein said of Bush's hawkish words at West Point. "I think it would be a terrible mistake for the United States, unilaterally, to attack Iraq, and to do so without any congressional authorization. "If you do this and leave unsettled the Israeli-Palestinian crisis, which is a full-blown crisis, I think you turn the whole Muslim east against the United States," she added. The big question is whether other senators of both parties will insist that the president seek congressional approval for an attack on Iraq -or any other country on his roll call of "evil." On Sept. 15, Congress passed a resolution authorizing the president "to use all necessary and appropriate force against those nations, organizations, or persons he determines planned, authorized, committed, or aided the terrorist attacks . . . or harbored such organizations or persons." Right-wing ideologues are pushing the president to think he doesn't need to prove Saddam Hussein had something to do with Sept. 11. "Pre-emptive action" means America can attack another country -- and not just Iraq -- because we don't like it. Perhaps Bush's hawks should just go ahead and change the Defense Department back to the War Department and forget all this "Defense" stuff. Thanks. Until this article, I had never heard Chris Matthews utter anything, or seen him commit anything to writing, that made any sense. This is the first time I haven't been ashamed of the fact that Mr. Matthews claimed to be a fellow RPCV.